Iarnród Éireann is no longer safe for passengers or staff as a result of growing violence and anti-social behaviour, according to the head of the National Bus and Rail Union. NBRU general secretary Dermot O'Leary was responding to revelations on RTÉ's This Week, that anti-social behaviour had jumped by 43% in a two-year period. The union has called on Minister for Transport Shane Ross to establish a dedicated transport police, similar to in the UK. Figures show that there were more than 1,000 separate incidents of anti-social behaviour recorded by Iarnród Éireann since the start of 2017. In 2016, there were 492 recorded incidents of anti-social misconduct on rail lines; but by 2017 this had surged to more than 700 incidents. The figures show that the number of incidents has risen even further in the first five months of this year - with a rise of 25% when compared to the same period in 2016. A log of all assaults and incidents of passenger misconduct on the trains, obtained by RTÉ, catalogue a litany of aggressive behaviour, criminal damage, fighting and attacks against staff. Iarnród Éireann has recorded 20 separate assaults against employees since the beginning of last year, the figures show. However, one rail employee said that the officially recorded figures only "scratched the surface" of the problem - and he said that he had been personally assaulted a number of times himself in that period. He said he had been kicked in the testicles, had a fire extingusher thrown at him, he and a colleague had been attacked by youths wielding snooker balls in a sock; he was repeatedly pushed and in one instance after giving a lift in his own car to an injured colleague they were both followed by a gang for almost an hour until gardaí intervened. He said it had become commonplace for angered commuters to use video cameras to record rail workers faces and to threaten them, saying their personal details would be "found" via Facebook. 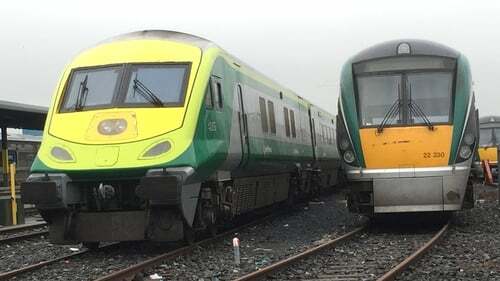 The experienced rail worker, who did not wish to be named but did allow RTÉ to validate his identity with the company, said that things had gotten noticeably worse in the past two years and blamed the reduction in staff assigned to stations as a factor. According to the letter from the NBRU to Mr Ross, which has been seen by RTÉ, the union called on the minister to begin a discussion around the establishment of a dedicated transport police. Doing nothing was "not an option", the letter states. Speaking on This Week, Mr O'Leary said that attacks against staff and anti-social behaviour by some customers had gotten so bad recently that "the time was coming" when rail workers would have to consider refusing to work on train lines in which there were persistent incident black-spots. Mr Ross was not available for interview on the issue.